If you’ve been reading this blog for any length of time, you know by now that I analyze and analyze and analyze every book or movie I invest time in. It’s one of my favorite things to do! And I think that’s largely why I love period drama so much – there’s so much to analyze! The gorgeous England scenery and handsome heroes help, but the stories are complex and have so many thought-provoking aspects, which is perfect for my ever-active brain. In a previous post, I described several things that fascinate me about this genre, and I’ve now got more! As I’ve continued to enjoy period British dramas, I’ve come to discern some not-as-obvious elements of it that give it meaning for me, and I think all of these are things we ought to take note of now and learn from. I think that’s the case with any period story, and that quote kind of made me realize it. We’re so overwhelmed with options and distractions today that I do find myself envying the characters I watch because they weren’t constantly taking in the volume of information that we do or overwhelmed with endless options for important life decisions. I enjoy the scenes on this bench in Downton. Something about it gives that peaceful feel to the moment. Can we all take note of this, please? Mr. Darcy helping Elizabeth into the carriage in Pride and Prejudice. Not only was this a common polite gesture, but here, it's a significant moment because it's the first time they've touched at all. I like that it makes you realize how important it was when we wouldn't think twice about hands touching now. Family was of paramount importance in this period in England, as we see through the endless talk of “connections,” “rank,” “family honor,” and countless other terms. You were your family, and your behavior reflected on them for better or worse. While I’m glad that the pressure in this area has changed, I’m reminded of the value of family and community when I watch Pride and Prejudice, Sense and Sensibility, Downton Abbey, or virtually any other British drama. The sister relationships in Jane Austen’s novels are precious things to observe, and family loyalty is a steadfast theme throughout all the seasons of Downton Abbey. Not only was family instrumental to your place in society at the time, but it also was a constant presence in everyday routines. The lavish dinners you see in Downton Abbey were the real deal! They could last well over an hour or two, especially if guests were dining with the family, and after dinner, wine and coffee and cards in the drawing room could last well into the night. Again, I’m glad we don’t have to do that every night now, but when I watch it, it does remind me of the value of time with family and friends that we’re often “too busy” for now. It’s a good reminder to not take it for granted! 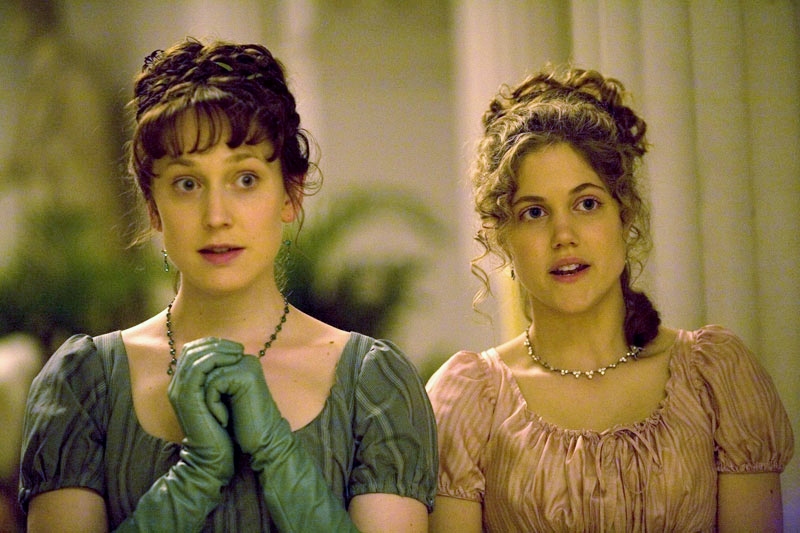 Elinor and Marianne Dashwood might be the sweetest sister relationship of Jane Austen's creation. They're polar opposites, but love each other devotedly and learn from each other's differences. Thank you, period drama, for these things. I think we could all definitely take some notes from them. People of every new era naturally think we have the most objective point of view, as Eric Metaxas wisely points out in a new book of his, but that is a dangerous tendency reeking of pride. As he exhorts, studying the past exposes our own cultural prejudices and preconceived ideas about important life issues, and I think the eras portrayed in period British dramas have much to teach us in all these mentioned areas and more!